The Thanksgiving holiday is almost upon us here in the USA. Our office will be partially shut down for the week of November 19th through November 23rd. 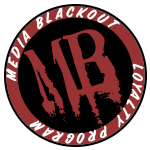 We will have very limited phone support during the week of the 19th, so we encourage our clients to email us at sales@mediablackout.net for faster service. During this time, we will only be processing orders that were placed before November 15th. Walk-ins will only be available for order pickup or service drop-offs. All new orders will be processed on November 26th. We thank you for your patience, and we hope that you have a great week and an even better holiday!